Another day, another gushing review, this time by a certain AA Gill. His two pages in the weekends Sunday Times will no doubt have many others slobbering with anticipation, keen to get a table at Heston’s newest venture. I was no different. The minute the reservations line opened, I got my name down and was ecstatic to have chalked up a booking. My reservation was a week after it had opened, and with every day as I inched towards my reservation, reviews started leaking out, all heralding Heston and APW as the second coming. I was excited, very excited. Alongside, I was bringing the harshest critic I knew, my dad. 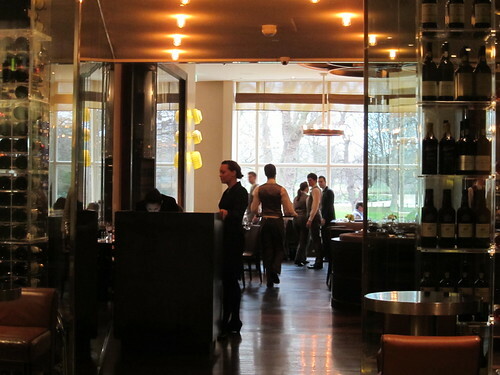 So on the day, I got all dressed up and headed up to Knightsbridge, even arriving early enough to plonk myself at the bar, enjoy a drink and peer into the dining room. This is the first moment the doubt started to creep into my mind. The dining room is a little staid, and with my 2pm booking looming, it was beginning to empty. As I watched each person leave, it felt like little nuggets of character were leaking out of the room. When we were finally seated, the room was half empty. It's a strange sensation walking into the Dinner dining room. Indeed, there is a quite pleasant view of some grass, and a rather large open kitchen on view to the world, but the dour beige & brown interior don't add much to the rooms atmosphere. 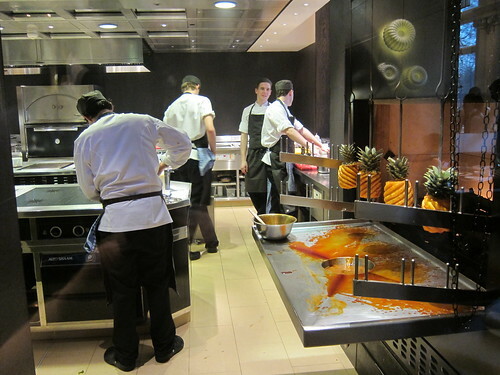 I was slightly disappointed by the initial lack of pineapples on the now famed clockwork spit, but the thing that threw me the most was how laid-back the kitchen appeared. I took this as confidence as the four of us squabbled who would eat what. To start, I settled on savoury porridge, a herby spelt risotto adorned with cod cheeks. What you get is a vivaciously green and light dish, with many flavours racing over your tongue. 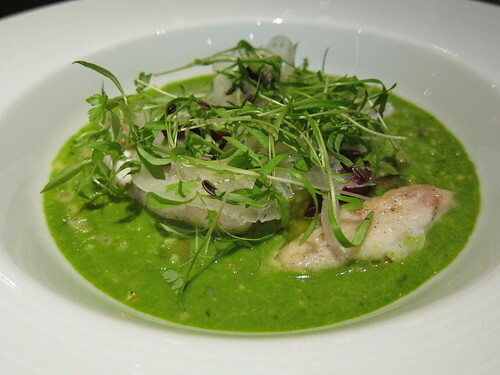 The salty cod cheeks were lifted by the multitude of herbs used in the porridge as well as those adorned over the top. Nuggets of beetroot added bursts of colour and flavour. It didn't make the earth move, but certainly got my appetite going, and I awaited my next course intently. There was of course the meat fruit, which with so many superlatives already applied in numerous write ups, how could it possibly live up to expectation? In all honesty, it was very good pate, with the chicken livers as smooth as I have ever tasted, and the expertly charred bread adding an additional smoky flavour. Of the other starters, I found the hay smoked mackerel a delightful combination of intriguing flavours, where the "meat and flesh" was sadly disappointing and a rather boring saffron risotto dotted with shreds of ox tail. Unfortunately I didn't fare so well with my main. 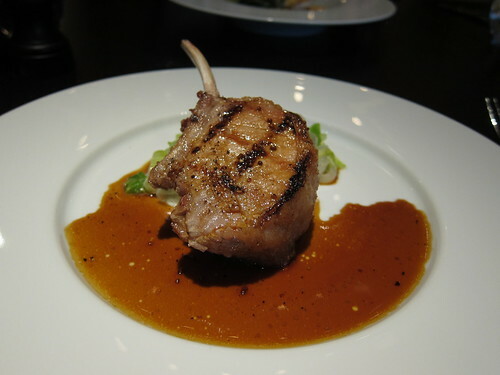 The black foot pork chop should be the dish of my dreams, but what I got was a chewy, over salted pork chop, with flabby edges and nothing more than a smattering of cabbage and some sweet sauce along for the ride. I tried to enjoy it, but chew after chew, I couldn't help but think that this was one of the least intelligent £28 I had ever invested. Other mains were equally underwhelming. 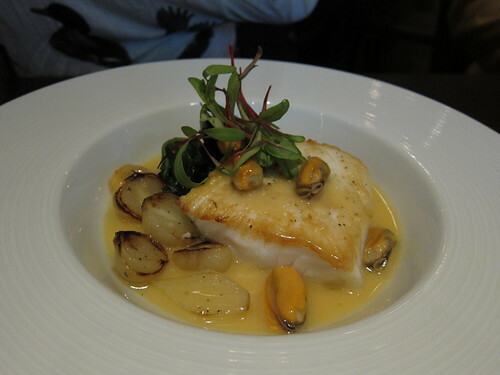 My fathers turbot was a mish mash of strong contrasting flavours, with the flavour of the "king of fish" totally lost. The powdered duck was better, but the Asian influenced flavours were quite ordinary. Best of all the mains was the cod in cider, which was delicious and comes highly recommended. 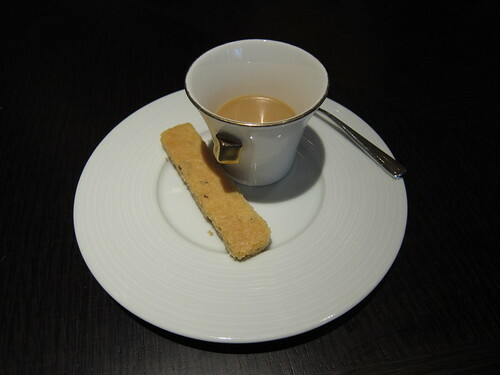 I really hoped the desserts, probably my favourite course in my old age, would lift the rather sombre mood, and on the whole, they were very good. Brown Bread ice cream may sound a relatively ordinary dessert, but I guess anything out of the Fat Duck stable is hardly going to be ordinary. The large scoop of ice cream was malty and rich with the bitter malted yeast syrup a pleasant contrast. A bed of crunchy bready nuggets, packed with wisps of citrus, all sitting on sweet and salty caramel. A dish packed with contrasting flavours and textures, reminding me of the invention and flavours I had hoped for. 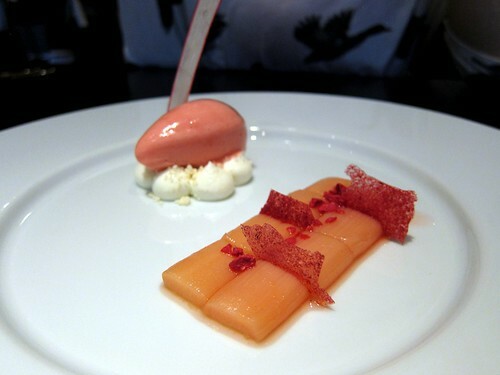 Another dessert of "rhubarb" was quite straightforward, and at £8 for a few slices of rhubarb and sorbet seemed rather dear. Chocolate bar was reminiscent of the famous Louis XV I recently tasted at Gauthier Soho, sweet, indulgent, but most of all, chocolatey. Last but not least, we had to have the Tipsy cake and pineapple, which came out a little on the sloppy side, but was still extremely pleasant. As we were brought out a white chocolate and earl grey ganache petit four, I asked my dad what he thought. He proclaimed that he had enjoyed his meal but remained restraint. Unfortunately, this wasn't really the reaction I had hoped for, but I understand where he was coming from. The food on the whole was good but there were inconsistencies throughout the meal, really not what I would expect from a restaurant of such stature. Fireworks were lacking at any point, although a faint spark was ignited by the time we had tasted our desserts, a bit late for my taste buds to start tingling. Service was on the whole decent, but at times, it took far more effort to get a waiters attention than was necessary. Reading other reports, I can't help but think that much of what we experienced was an "off" day, but restaurants such as this really shouldn't be experiencing off days. I guess we will see how Dinner develops, but for the time being, I am in no rush to go back. For more pictures, please check out my Flickr stream here. Aah...places likes this shouldn't have 'off' days! 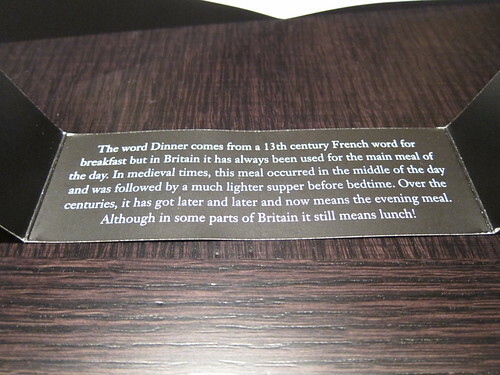 So having returned for dinner did it confirm or change your mind? @ Kay - Most people I know have had excellent experiences here. I am kind of wondering why I wasn't so wow'ed. @ Lizzie - I never actually returned. It was meant to be this week, but I have given up my seat. I am sure I will go back one day, but I am certainly in no hurry to do so. Nice to read a different point of view that seems written with sincerity (i.e., not just to be contrarian). I'd gotten the sense that the mains were the most uninteresting parts of the Dinner menu, and your experience seems to bear that out. What day of the week did you visit? If it wasn't the weekend it can't be that surprising that the room was emptying at 2pm and the kitchen was kicking back a bit, it sounds like service was drawing to a close. Then again, for that price I accept that whatever time or day you're there you should be getting a great meal. @ AiL - If I go back, I would have two starters and two desserts! @ Anthony - It was a Sunday lunchtime, and I think we were amongst the last to arrive. But yeah, there shouldn't be inconsistencies at this level, especially with seasoning. Nice to see a review that says something different; most people appear to leave their critical faculties at the door when they walk into Dinner. It's a shame that your pork chop was chewy as ours was perfect! You are right- restaurant charging this price should not have any 'off' days! The rhubarb dessert certainly did not look too attractive! We think a few dishes we ate there tasted quite Chinese too! I didn't rush to book and will give them a few more months before I go. After yours and MiMi's reviews, am not in a hurry.